CAPITAL ECONOMICS: ΤΑ ΚΑΛΥΤΕΡΑ…. ΕΡΧΟΝΤΑΙ ! Standing at a urinal on a Saturday afternoon last year, Christos Marafatsos glanced right and did a double-take. He was startled to find he was relieving himself shoulder-to-shoulder with Nicolás Maduro, the repressive dictator of Venezuela. “Bro, He’s a bear. He’s a monster,” recalled Marafatsos. “He’s literally twice the size of me,” he said, referring to the embattled president’s hulking, six-foot-three-inch frame. The brush with a dictator occurred at the December inauguration of Mexico’s new president, Andrés Manuel López Obrador. Marafatsos, the American-born son of a Greek immigrant, had been invited in his capacity as a leader of the National Diversity Coalition for Trump, formed during the Republican primary by then-candidate Donald Trump’s 2016 campaign amid accusations of racism. He had come a long way to be there. Just three years earlier, the 32-year-old Marafatsos was a striving millennial entrepreneur with few big-league connections. A fledgling investment firm he’d founded was registered to his parents’ home address in suburban Maryland. Then, through a combination of pluck and luck, he rode an early ticket on the Trump train into the upper echelons of global power and money. Now, he regularly visits the White House, accompanies the likes of Ivanka Trump and Ben Carson on official excursions, and lives the life of a globe-trotting deal maker. Those connections have been good for his business. Trump has been photographed in the Oval Office with a document bearing the logo of Marafatsos’ investment firm lying on his desk. Last year, he became a partner in a multibillion-dollar Saudi real estate venture launched under the auspices of Crown Prince Mohammed Bin Salman’s Saudi Vision 2030 initiative. For a certain kind of hard-working outsider willing to go wherever it takes — and do whatever it takes — it has been the sort of rise that could only happen in the Trump era. He lavished praise on the Trumps — “I’ve never seen them be not nice,” while talking up his multiple and expanding business ventures. He reports that he is diving into health care, investing in detox clinics and pharmacies in “opportunity zones” — areas that benefit from special tax incentives, which happen to be part of his diversity coalition’s plan for revitalizing poor urban neighborhoods. “I’m dynamic in the fact that I’m well-rounded in a lot of different industries,” he said. Before hooking up with team Trump machine, however, he had more in the way of aspirations than achievements under his belt. Growing up in the ’90s in suburban Maryland, Marafatsos, the son of a building contractor and a teacher, was more interested in business than politics — not yet aware of just how fully those two worlds intersect. As a teenager, he read his older brother’s copy of “The Art of the Deal,” before going on to attend the University of Maryland and to launch a fresh produce company with a friend. That venture that would land him on a list of finalists for Bloomberg’s 2011 ranking of the best entrepreneurs in the U.S. under 25. Marafatsos was soon ready for bigger things. He sold his share of the produce business while pursuing a master’s in finance at Georgetown. Then he took a job with a small trading firm called Ace Investment Strategists in Northern Virginia. The firm would be shut down after a National Futures Association complaint about its business practices, but by then, Marafatsos was already on to the next thing, as he often is. In early 2013, he founded a firm called Blue Sky Capital, whose slick website and complex investing strategies evoked a high-flying hedge fund in a place like New York or Hong Kong. In reality, corporate documents show that it was registered to his parents’ house in Silver Spring, Maryland. As he struck out on his own in business, Marafatsos was also beginning to dabble in politics. A formative experience had come a year earlier, when he attended the 2012 Republican National Convention in Tampa, thanks to his Georgetown program. At the time of the 2012 convention, Marafatsos, who looks like a Mediterranean Donald Trump Jr., was fresh off a vacation in Greece and boasting a deep bronze tan. That made him aware, he said, of just how pale the rest of the RNC crowd was. “Literally I was one of the darkest people there as a Greek-American,” he recalled. Marafatsos continued to dabble in politics, attending the annual Conservative Political Action Conference the following winter, as he set about building his business. At Sundance Film Festival, he met Jeremiah Bitsui, a native American actor known for playing Victor, an enforcer for a meth-dealing syndicate on the television series “Breaking Bad.” (Coincidentally, on the show, the syndicate’s meth is known on the streets as “Blue Sky”.) The pair joined forces to sell Blue Sky’s services to Indian tribes. Meanwhile, he became more active in Republican circles. Marafatsos recalled meeting Trump for about a minute at CPAC as the mogul was eyeing a presidential run and chatting with him about the economy. “I felt like his intentions were great,” Marafatsos recalled. He also met with former Louisiana Gov. Bobby Jindal in Baton Rouge, attended the Faith & Freedom’s Coalition Patriots Gala, and visited the NRA’s Institute for Legislative Action, posting about the experiences on Facebook. In mid-2015, the mogul launched his campaign for president by disparaging Mexican immigrants, and from there made a series of racially inflammatory remarks. After a contentious November meeting with black pastors at Trump Tower, Trump’s fixer, Michael Cohen, who is Jewish, and one of the pastors, Darrell Scott, set about forming a National Diversity Coalition to counter the widespread view that Trump was running a racist campaign. The coalition organized meetings, promoted Trump on social media and found surrogates to defend him publicly. Omarosa Manigault, a black Trump supporter and early contestant on “The Apprentice,” served as vice chair. Few establishment figures were willing to publicly embrace Trump at the time, so the coalition turned to outsiders and ambitious up-and-comers. People like Marafatsos. People of Greek descent make up less than 1 percent of the U.S. population by most estimates, but by the coalition’s big tent ethos, Marafatsos was a prime candidate. How exactly Marafatsos was enlisted into Trump’s diversity coalition remains unclear. Marafatsos said someone — he declined to say who — from the coalition messaged him on Facebook and then connected him by phone with Georgia businessman Bruce LeVell, the coalition’s executive director. Cohen, who founded the coalition, told POLITICO that “Christos came in through Darrell Scott and worked directly with and through him.” Reached by phone, Scott, the coalition’s CEO, said he was busy and would call back later to discuss Marafatsos, but he did not respond to follow-up calls. LeVell said he could not recall how exactly he and Marafatsos connected. “It was a lot of activity back then,” he said. However it happened, LeVell praised Marafatsos for his willingness to join the Trump cause early on. «Very few minorities were courageous enough to stick their head out in 2015 and 2016, and he was courageous,” LeVell said. 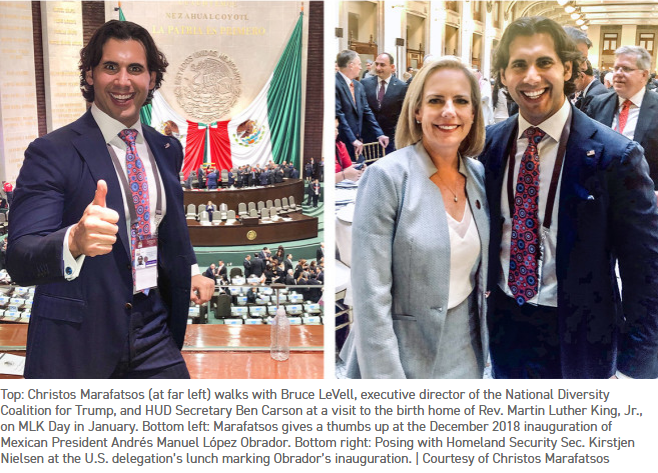 Marafatsos dove in, helping with fundraising, attending the Cleveland convention, where Breitbart featured him posing next to former House Speaker Newt Gingrich and touting a “Greeks4Trump” Twitter hashtag. “They made me advisor within the Greek community,” Marafatsos explained. The other Greek-Americans who jumped on the Trump train early on spoke positively, but vaguely of him. “Seemed like a nice guy,” said George Papadopoulos, an early foreign policy adviser to Trump, who reported having one brief encounter with Marafatsos during the campaign. Against the odds, Trump and his ragtag team won the election. Days later, Manigault entered the administration as the director of communications for the White House Office of Public Liaison. Impressed by Marafatsos’ performance, the leaders of the coalition tapped him to replace her as vice-chair. The firm, Global Business Ventures, put Marafatsos and Blue Sky’s chief operating officer, a Florida doctor named Amin Halum, in business with one of the richest families in the world. Among their partners in the venture is Abdullatef Abdullah Al Rajhi, a scion of the billionaire Al Rajhi banking family, among the most wealthy families in the kingdom outside the royal family. “My team’s role would be to serve as the financiers and assemble the right team to get projects of this magnitude completed around the world,” Marafatsos explained. For a young entrepreneur with no prior experience in developing massive real estate projects, becoming a partner in such a venture was a coup, but Marafatsos did not stop scouring the globe for new opportunities. In November of 2017, he traveled to Hyderabad, India, where he participated in the American delegation accompanying Ivanka Trump to an entrepreneurship summit. He described his interactions with the first daughter on the trip as “brief but meaningful,” but did not go into further detail. The next month, Scott met with Trump in the Oval Office and presentedhim with materials related to the diversity coalition’s Urban Revitalization Initiative, touted as a plan to attract investment to poor inner-city neighborhoods. Among the handful of bound booklets staring up at Trump from the Resolute Desk was one bearing Blue Sky’s logo. 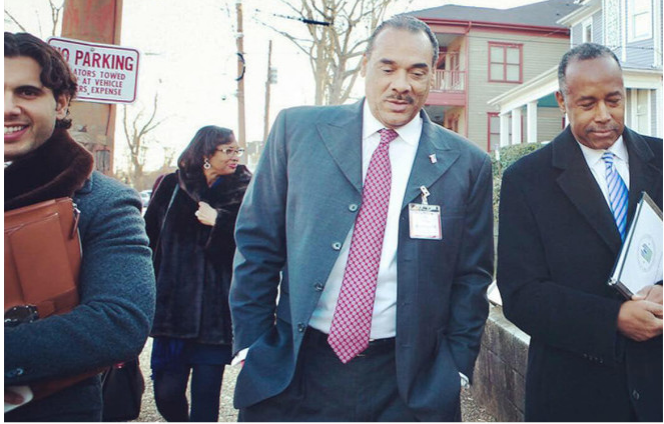 Last January, Marafatsos accompanied Housing and Urban Development Secretary Ben Carson to Atlanta, where they toured Martin Luther King Jr.’s first childhood home and met with King’s niece in honor of MLK day. Crown Prince Mohammad Bin Salman had arrived in Washington three days earlier to kick off a tour of the U.S. It was largely designed to promote the Saudi Vision 2030 plan. But even as it was landing big-time deals, Blue Sky was still dealing with small-time problems. Last summer, its website was hacked and briefly defaced with ads for erectile dysfunction medication, prompting his web developer to upgrade its security. There were bigger problems, too. In October, Saudi agents murdered a U.S. resident and Washington Post contributor, Jamal Khashoggi, inside the kingdom’s consulate in Istanbul, a killing that the CIA reportedly attributed to the crown prince’s orders. Three weeks later, the Saudis held a global investor summit in Riyadh, dubbed “Davos in the Desert.” Fearing reputational risk, many of the highest-profile invitees dropped out. Not Marafatsos. He not only attended the gathering, but gave interviews to Al Jazeera and CNN minimizing Khashoggi’s murder and praising the U.S.-Saudi alliance. But such unpleasant experiences are the cost of doing business, and business is expanding. At the moment, he is focused on on launching Blue Sky Health Care, investing in detox clinics for opioid addicts and pharmacies in opportunity zones. The zones are a cornerstone of the coalition’s Urban Revitalization Plan, which aims to attract development to stagnant areas through government support and tax incentives. Marafatsos recalled a meeting he and Scott attended in the Roosevelt Room with Jared Kushner and other administration officials last year to discuss the zones. At the meeting, the young entrepreneur sat next to boxing legend Evander Holyfield, a Trump supporter and backer of the coalition’s revitalization plan. The new Republican tax law provides significant tax breaks for investors in the zones and a December executive order issued by Trump calls on the federal government to support development in them. Scott, the coalition’s CEO, stood behind Trump at the signing of the executive order. The zones are but one among the many places Marafatsos is looking to do business. From the St. Regis, he was off to Panama, to attend the opening of a new IMAX theater in conjunction with Morgan Freeman, and then on to more travel, to Dubai and beyond. It’s part of a grueling schedule that sees him on the road well over 200 nights a year. CORRECTION: A previous version of this story misstated Christos Marafatsos’s age. He is 32 years old.